This volume is a collection of nineteen original essays by leading specialists on the history, historiography and memory of the Crusades, the social and cultural aspects of life in the Latin East, as well as the military orders and inter-religious relations in the Middle Ages. Intended to appeal to scholars and students alike, the volume honours Professor Sophia Menache of the Department of History, University of Haifa, Israel. 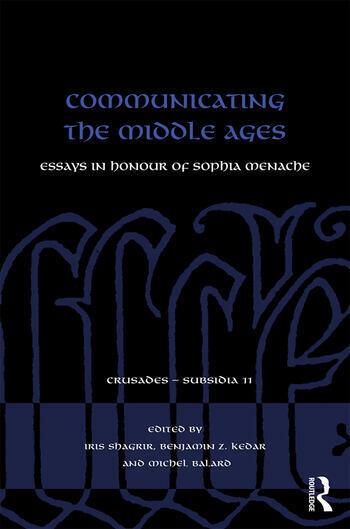 The contributions reflect the richness of Professor Menache's research interests - medieval communications, the Church and the Papacy in the central and later Middle Ages, the Crusades and the military orders, as well as the memory and historiography of the Crusades. Written Communication in the Later Middle Ages – The Letter Registers of the Teutonic Knights in Prussia. Frankish Bathhouses. Balneum and furnus – A Functional dyad? Iris Shagrir is associate professor of Medieval History at the Open University of Israel. Her research focuses on crusade history, religious, cultural history of the Latin Kingdom of Jerusalem, pilgrimage, liturgy in the Latin East and medieval anthroponymy and interreligious relations in the Middle Ages..
Benjamin Z. Kedar is professor emeritus of Medieval History at the Hebrew University of Jerusalem. He is the founding and active editor of the journal Crusades. Formerly president of the international Society for the Study of the Crusades and the Latin East (1995–2002), chairman of the board of the Israel Antiquities Authority (2000–12) and vice-president of the Israel Academy of Sciences and Humanities (2010–15). Author of 40 books and 250 articles. Michel Balard is professor emeritus of Medieval History, University Paris 1 - Sorbonne, chairman of the Society for the Study of the Crusades and the Latin East (2001-2008), chairman of the Federation of the historical Societies of Paris and Ile-de-France (1999-to-day), author of 43 books and 280 articles.